Russia Manufacturing PMI posted slight acceleration in downward momentum in July compared to June. Operating conditions deterioration was "reflective of soft demand which undermined production and new order intakes. Jobs continued to be lost, while firms reduced their inventories at a marked and accelerated pace." Profit margins were continuing to fall under pressure: "On the price front, competitive pressures and lower demand encouraged firms to cut their charges marginally during July. That was in spite of a marked and accelerated increase in input costs." July data, however, shows that "the rate of decline was fractional and remained centred on the investment goods sector as consumer and intermediate goods both recorded growth of production compared to the previous survey period." Forward looking indicators: "Similar trends were seen for new orders, with a fall in orders for investment goods leading to a decline at the aggregate level. …Levels of new business from abroad also continued to decline during July, with the rate of contraction accelerating since the previous survey period to the sharpest recorded since April." 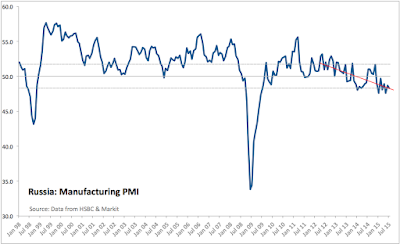 Manufacturing PMI is now down at 48.3 compared to 48.7 in June 2015 and 51.0 in July 2014. 3mo average through July is at low 48.2 against 3mo average through April at 48.9 and against 49.7 3mo average through July 2014. 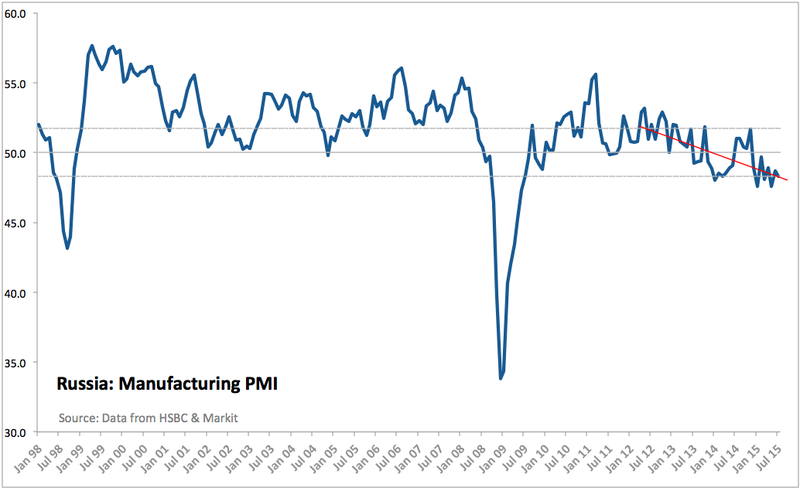 Russian Manufacturing PMIs have been below 50.0 mark for 8 consecutive months now. Within the broad sector, imports substitution is presenting some upside opportunities in consumer goods and intermediate goods, while investment-driven capital goods are showing sharp contractions.